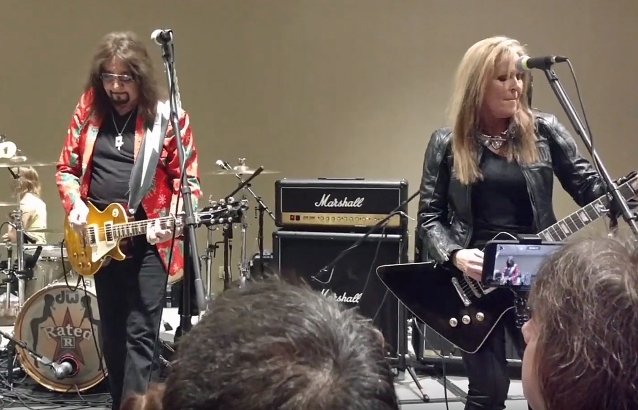 Video footage of Ace Frehley and Lita Ford performing THE TROGGS classic "Wild Thing" at the New Jersey Kiss Expo 2018 on December 8 at the Hilton Parsippany in Parsippany, New Jersey can be seen below (courtesy of YouTube users "William J. Buggeln" and "Chris Cook"). Also available is video of Frehley jamming on "Tush" with Punky Meadows and Frank Dimino (of ANGEL), Vinny Appice (of BLACK SABBATH and DIO) and Jean Beauvior (of THE PLASMATICS). At the end, Ace performed the KISS classic "Cold Gin" with his solo band consisting of Philip Shouse on guitar/vocals, Ryan Cook on guitar/vocals, Jeremy Asbrock on guitar/vocals, and Matt Starr on drums. Frehley's latest solo album, "Spaceman", was released on October 19 via eOne. On December 9, Frehley celebrated the 40th anniversary of his acclaimed 1978 solo debut by performing the album in its entirety for the first time at the New Jersey Kiss Expo. Frehley first left KISS in 1982. He rejoined in 1996 and parted ways with the band once again in 2002, soon after the conclusion of their first "farewell tour."